The Atlanta Thrashers were an American professional ice hockey team that played in Atlanta, Georgia. They played in the National Hockey League (NHL). The Thrashers played their home games at Phillips Arena. The team played in the Southeast Division of the Eastern Conference. They only made the playoffs once in their existence. 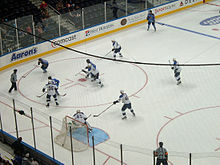 On May 31, 2011, investors named True North Sports and Entertainment purchased the Atlanta Thrashers and are supposedly moving them back to Winnipeg, Manitoba, if the sale is approved by the NHL Board of Governors. The sale was approved by the National Hockey League on June 21, 2011. The Thrashers did not qualify for the playoffs. ↑ "Hockey fans celebrate as NHL set to return to Winnipeg". Winnipeg. 2 June 2011. ↑ "NHL Board unanimous on Winnipeg sale, relocation". NHL.com. ↑ "2007-2008 Standings by Division - NHL.com - Standings". NHL.com. The National Hockey League. Retrieved 2010-05-10.